Achieving a great SAT score can open new and promising doors for you. Especially if you need to take that exam so that you can study in the college of your choice. There are two main topics covered by the SAT, and they are Math and Evidence-Based Reading and Writing. The Essay test is optional, and you need to take it if required by your target college. The SAT Reading test is an important component of the Evidence-Based Reading and Writing section. Fifty percent of your score in the Evidence-Based Reading and Writing topic of the SAT is obtained from the Reading test. The other 50% comes from the Writing and Language test. You can definitely surmount the SAT Reading test with proper studying and preparation. You’ll need to implement an effective and efficient test prep in order to get a good SAT Reading score. You wouldn’t need to memorize rigid grammar rules or formulas. However, you need to gain knowledge about the best approaches to reading each of the passages included in the test. 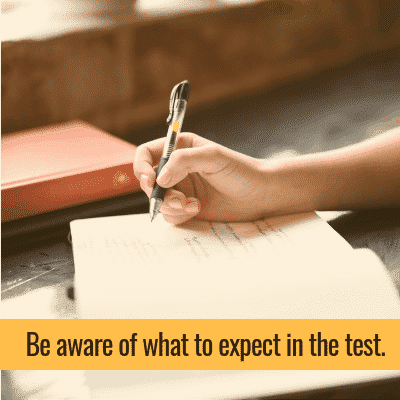 Be aware of what to expect in the test. There are 5 passages featured in SAT Reading, and they are based on the topics of Social Studies, Literature, History, and Natural Science. You should be able to read these passages and answer the corresponding 52 questions in a time limit of 65 minutes. Several skills are required for getting a good score in this test. For one thing, you ought to know how to determine what some words mean according to their context, decide about the reasons why the author included specific details, figure out the main idea of particular passages, pinpoint facts and details in a graph and compare one passage to another. Choose the order you are most comfortable with. You can choose to answer easier questions first and even skip the hard ones. Questions in SAT Reading may be presented in a chronological sequence, but you have the option to answer them in the order that you want. Read the parts in the passage that you only need to read. It’s actually a waste of time to read every word and detail in the SAT Reading passages. Nor would you need to be an expert in their respective topics. Considering that the passage is right there in front of you, a practical strategy is to move forward and backward between the pertinent portions in the passages and their corresponding questions. Skip reading all of the minute details, but focus on obtaining the information that you need to respond to the questions. Steer clear of giving your opinion. SAT Reading will not require you to state your opinions, unlike in your English class. Be especially careful when you encounter the words, “infer”, “suggest” or “imply”, among others. Reckon that although the answers aren’t directly stated in the content, there still may be ample evidence in there that supports the right answers. 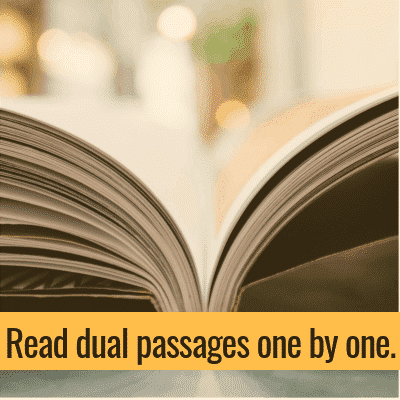 Read dual passages one by one. In either of the History or Science topics, you’ll find that they are presented in dual passages. That is, it tends to be comprised of two shorter texts about the topic. You can save time in tackling these items by first responding to the first passage, next on to the items in the second passage and lastly answer the questions about both the passages. Doing this strategy will also spare you confusion when you’re assessing the answer choices when reading both of the passages. Answer the main idea questions last. 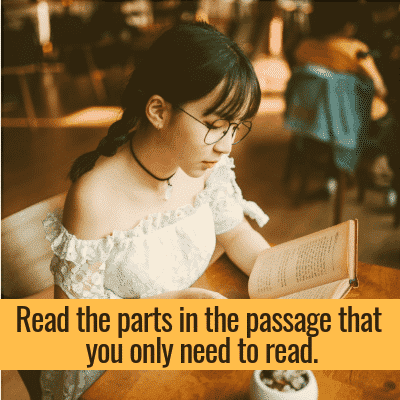 The SAT Reading passages tend to first ask questions about the purpose or main idea of the text, the point of view of the narrative and the shift that takes place in it. Since you haven’t read the passage yet, it is not advisable to initially answer these general questions. 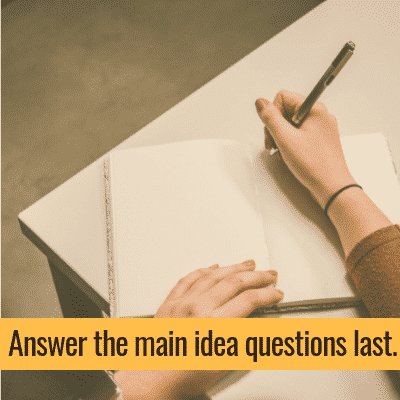 It’s best to deal with the other questions first so that you can gain a good idea of the overall themes incorporated into the content. These are some of the valuable tips about how to get a good SAT Reading score. Equip yourself with these along with the necessary knowledge and information about the section by way of a smart and effectual test prep method so that you can attain the results that you want.